August Smart Lock: your smart home should start at the front door! When I left the house this morning, I opened an app on my phone and locked my front door while walking away from it. Some would say not a big deal, right? Well in today’s climate of composting, recycling, solar panels, and energy consciousness, I say it is a big deal. From a convenience perspective, walking to my car in the driveway being able to leave my house completely secure without taking out my keys is great. Additionally, I didn’t use any electricity to open and close my garage door, or for the lights in the garage that would then stay on for two minutes after the door closed. Sure, maybe a minor blip of savings for that one instance but add that up a couple of times a day over several months and I’m confident that routine is at least keeping a couple of dollars in my pocket this year. There are many products that add some smarts to your front door at various price points – this review focuses on the August Smart Lock & Connect. 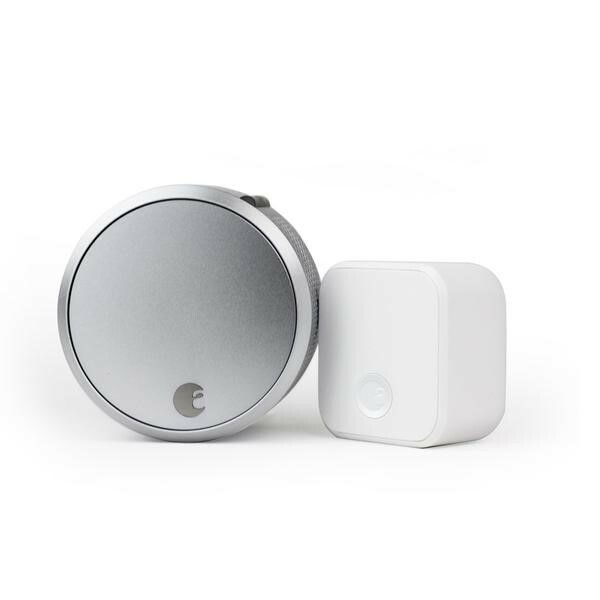 This combination retails for $280, which some consumers find prohibitive, but if you’ve ever returned home to check if you locked the door, the peace of mind that this device provides quickly justifies the investment. The next time you arrive at work with that nagging "Did I lock the door?" feeling, you can check. You control access through the connect device plugged into a nearby electrical outlet at home. Lock, unlock and check the status of your door on your phone from anywhere. No more keys for family, friends, or the housekeeper. Simply give key-less entry to anyone with a smart phone who needs access to your house. The activity log tracks who’s come and gone for the past month. Want to know every time your door is locked or unlocked? Simply set up smart alerts to notify you of those activities. The basic setup will let you lock and unlock the door by tapping on your smart phone. To automate locking upon your exit, enable the auto-lock feature to lock shortly after it’s unlocked. If you are ready to fully automate your return home, simply set up the auto-unlock feature, which pairs the lock to your phone so when you leave a 200-meter radius around your home the lock goes into ‘away’ mode. Upon your return home, your phone will search for the lock and unlock it as you approach the door. No keys in your hand, no phone in your hand, no problem. Regardless of the product you choose to smarten your door contact Smart Home Solutions for professional installation and setup!